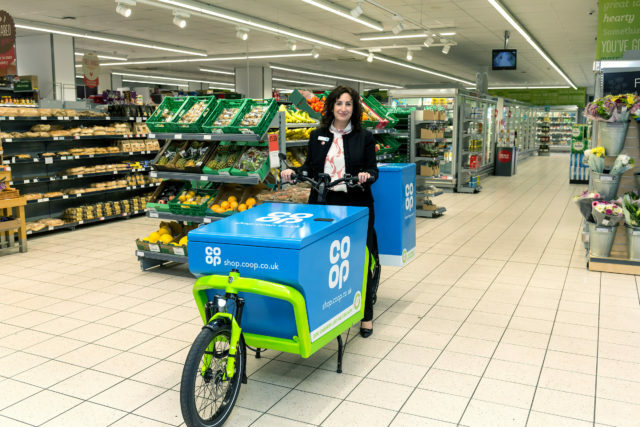 The Co-op has launched its first online delivery service with the use of electric cargo bikes. The supermarket said shoppers can now order products via a dedicated website, with a courier delivering the items by electric bike within two hours for a standard £5 charge on a minimum £15 spend. The service will initially be available to shoppers within a four kilometre radius of a store on the Kings Road in London’s Chelsea, before being rolled out to a further eight London stores. The retailer plans to make online shopping available in a number of UK towns and cities. James FitzGerald, managing director of e-cargobikes.com said: “We are thrilled that a highly respected national brand like Co-op are demonstrating environmental leadership by launching their online delivery service using e-cargobikes. The Co-op said it was considering a number of different home delivery schemes, and recently announced a free taxi grocery delivery service at eight stores around the UK. It is also trialling the use of robots in Milton Keynes to make small deliveries from a local store.